Former Cheltenham Gold Cup winner Imperial Call has died aged 25. In 1996, he became the first Irish-trained winner of the race since Dawn Run a decade earlier. Imperial Call, a four-time Grade One winner, was trained by Fergie Sutherland and ridden by Conor O'Dwyer to victory by four lengths from Rough Quest. 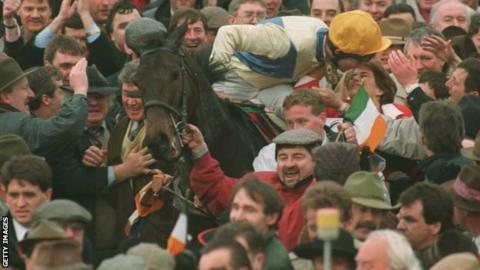 "Imperial Call, who won in such emphatic style that a repeat was immediately tipped, was hugely significant for Irish racing as in 1996 they were itching for another Gold Cup success 10 years after the victory of the iconic Dawn Run. Imperial Call also introduced to a wider audience his colourful trainer Fergie Sutherland - who died in 2012 - a British-born, Co. Cork-based ex-army officer who'd lost a leg during the Korean War. The combo really captured the sport's imagination as witnessed by the wild scenes of Gold Cup celebration." "To win the Gold Cup when I was 30 was a huge for me and I'll never forget him for that," said O'Dwyer. Imperial Call won 16 of his 32 races and totalled £414,633 in prize-money. He was also successful in the Irish Hennessy at Leopardstown in 1996, the John Durkan in 1998 and was ridden by Ruby Walsh to victory in the Punchestown Gold Cup in his penultimate race in 1999.